The 2015 Ford Mustang will be the first of the fabled pony cars marketed on a global scale so to show off the new Mustang V8 on one of the biggest European stages possible – Ford Motor Company sent a professionally driven Mustang GT to the famous Goodwood Hill Climb for the new muscle car’s first racing effort. While it has long been possible for prospective European buyers to pay big money to have a Ford Mustang imported and approved for road use, the 2015 Ford Mustang will be the first that is directly marketed to the European market. The Goodwood Festival of Speed is arguably one of the most prominent events in the European motoring world with heavy media coverage from all over the world making Goodwood a great place to show off a new model. Ford would show off the 2015 Mustang GT on a grand stage at Goodwood, marking the very first time that we get to see the next generation Mustang in racing action. For the 2014 Goodwood Hill Climb event, Ford showed off the performance of the 5.0L V8 powered Mustang that American buyers know as the Mustang GT. Behind the wheel is Paul Swift of Paul Swift Performance Driving and after being strapped into what we know as a full US spec 2015 Ford Mustang GT Premium with a manual transmission and Recaro racing bucket seats, he attacked Lord March’s Goodwood circuit. Thanks to a collection of cameras along the course and a couple in car cameras, we get a unique look at the 2015 Ford Mustang GT as it climbs the famous British racing course. We don’t get to see what kind of time the new Mustang ran, but we do get a great chance to see the next generation Mustang in what I believe to be its first ever racing action. There are plenty of shots showing the car coming and going at speed, giving us an awesome look at the Mustang in action along with some solid sound clips from the roaring Coyote V8 engine. Unlike the Chevrolet Camaro – which has been sold in Europe for a few years now but only with the V8 engine – the 2015 Ford Mustang will be available with both the powerful 5.0L V8 and the fuel friendly EcoBoost 4-cylinder engine. The 2015 Mustang V8 will offer at least 420 horsepower and at least 390lb-ft of torque to compete directly with the Chevrolet Camaro that is sold overseas with 426 horsepower. However, those folks who want the look of the 2015 Mustang and better fuel economy, the 2.3L EcoBoost 4-cylinder gives European buyers an option that they do not get with the Camaro. The EcoBoost will offer at least 305 horsepower while achieving better fuel economy and costing less at the dealership. More importantly, the turbocharged 4 cylinder engine is likely to be very popular in the European markets where having a monster motor isnt as big of a deal as having a sports car that handles well. 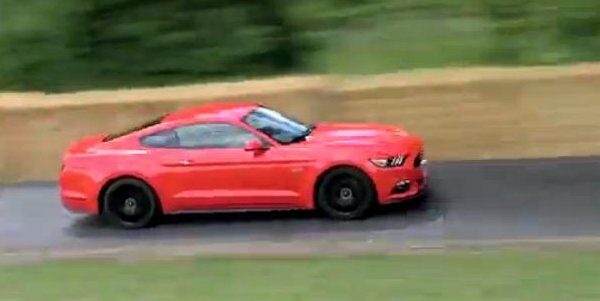 Crank up your speakers and enjoy this short clip of the 2015 Ford Mustang GT taking on the intricate course of the Goodwood Hill Climb. Quote: "Crank up your speakers"..."along with some solid sound clips from the roaring Coyote V8 engine"...but then for some choice editorial reason all we hear is a load of lame music mixed all over the top of the soundtrack...aren't you missing the point that readers would prefer to actually listen to the V8 engine, the one you mention so often in the article?